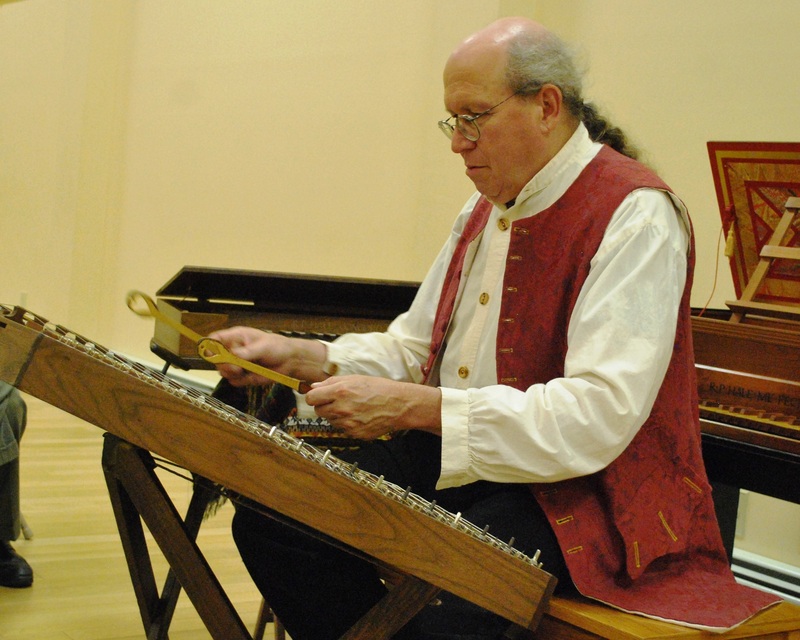 A small but enthusiastic group gathered at the WCA Red Barn on Saturday evening, September 16 for a harpsicord and hammered dulcimer concert. Dressed in period costume, R.P. Hale was the man behind the keys and mallets. Along with playing pieces by Sir William Herschel, Thomas Jefferson, and more, R.P. took a few minutes before each piece to discuss the piece as well as his instruments. A multi-generational and interdisciplinary artist-craftsman, R.P. has been teaching a variety of topics and skills since 1976.He is a concert harpsichordist and hammer dulcimer player as well as a harpsichord/dulcimer maker, master calligrapher and illustrator, pen-and-ink artist, nationally-known wood-engraver, Intaglio and Letterpress printer, wood carver, maker of marbleized papers and fabrics, period re-enactor, linguist, solar and archaeo-astronomer, and historian. In 1999, the Smithsonian Institute recognized R.P. as one of the top musical instrument makers in the U.S. and exhibited his work. His concerts reflect his wide-ranging musical interests from c.750 B.C. works from China to that of Sir William Herschel of the 1790s. Born to a Sonoran Mexican family of artists and printers, his programs “La História Cultural de México,” “El Calendro Azteca,” and “Astronomy, Math. Calendars, and Histories of the Maya,” respectively feature the history of Mexico as seen through the arts and traditional lore. R.P. received a Fellowship from the State Arts Council and in 2000 was invited to present his multi-faceted traditions at the Celebrate New Hampshire festival. 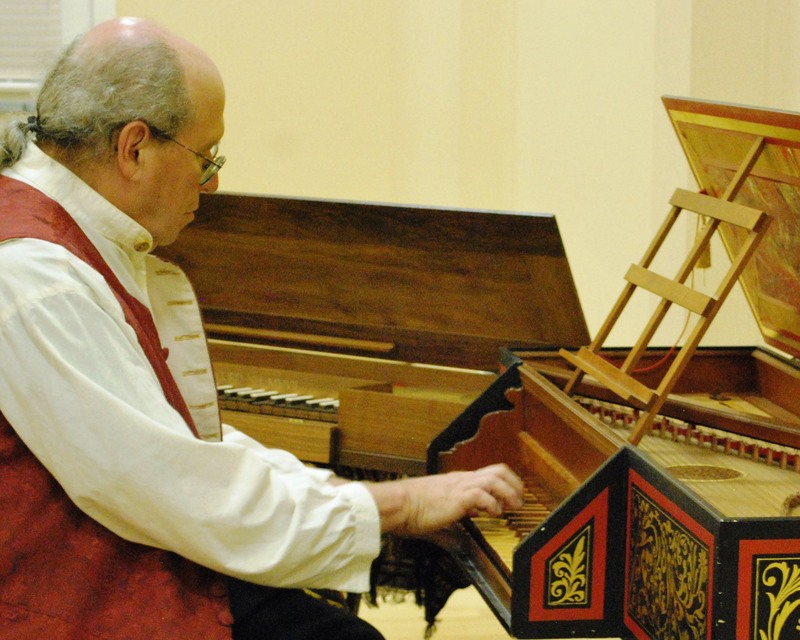 Along with his solo performances, he is in heavy demand by ensembles for his improvised accompaniment skills at the harpsichord and organ. R.P. teaches at St. Paul’s School and is Senior Educator at the McAuliffe-Shepard Discovery Center, specializing in spectroscopy, star evolution, mathematics, physics, astronomy history and archaeoastronomy. He has built a spectroscopy/optics teaching lab there. He taught summers at the Augusta Heritage Center in Elkins, West Virginia for 33 years and is a visiting faculty in art and astronomy at Davis and Elkins College. This entry was posted in Fall Concert Series, WCA, WCA Events, WCA News, WCA Programs, Wilmot and tagged Fall Concert Series, Free Concert, Wilmot, Wilmot NH by WCA_Admin. Bookmark the permalink.